Look at this! The flowers are so pretty and there are even petals falling down! And its pink too x_X Gosh.. Makes me feel bad about tearing it and throwing it away. Fit was perfect. Love love love the new thin sheet. I'm not too sure what fragrance is involved but it's floral, nothing too sickening. Kinda relaxing, actually. Perhaps it's kinda like aromatherapy ^_^ Just like the previous Strawberry Yogurt mask, the sheet was soaked yet didn't drip. Even after 30 minutes, the mask was still very moist! 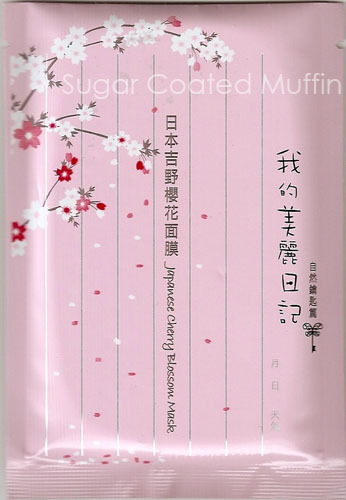 The Japanese Cherry Blossom Mask is for 'refreshing and whitening'. I left this on for half an hour while watching You Again (good show, btw.. I cried =_=) and when I took it off, I noticed my face was significantly brightened. Didn't last long though but temporary is better than nothing, right? 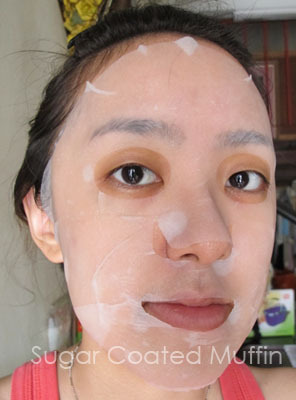 xD Other than that, my face was smooth, firm and so very moisturized. I would probably stick the mask wrapper on my wall..along with other beauty products cute packaging..ekeke..
Wow that's cheap for Guardian O_O But isit the upgraded version (thin sheet)? I didn't quite like the old one.. I felt that it wasn't moisturizing enough.